As a little girl, I always wanted a vanity in my bedroom. I just always found them to be so fashionable and "grown up." I never got a vanity, but I never stopped admiring them. I'm loving this antique Italian vanity. It's just light and girly. I can picture it in my "grown up" summer home- dream home that is. I love that it could double as a desk, too. What do you think? 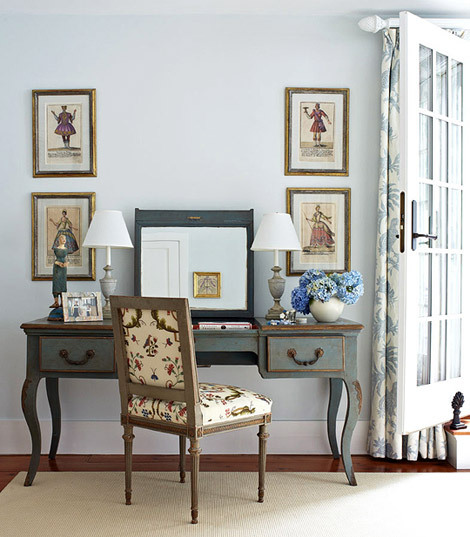 Do you have a vanity in your bedroom? that is just lovely!! I too remember as a little girl wanting a "make-up" table. And the little girl in me STILL wants one .